Built 1912-1913 as "Imperial Theatre" by Albert Westover for the Keith-Albee vaudeville chain and their Canadian subsidiary, Saint John Amusements Company Ltd. Opened 19 Sep 1913 with a gala performance. Used as a variety theatre and as a cinema. 1929 renamed "Capitol Theatre", subsequently used mainly as a cinema. Closed 1957. Subsequently used as a meeting space by the Full Gospel Assembly. After 1982, major restroation to the original designs by Douglas T. Köchel. Re-opened May 1994 as "Imperial Theatre / Théâtre Impérial". Originally ca. 1500 seats (+ 300 standing), currently 908 seats. 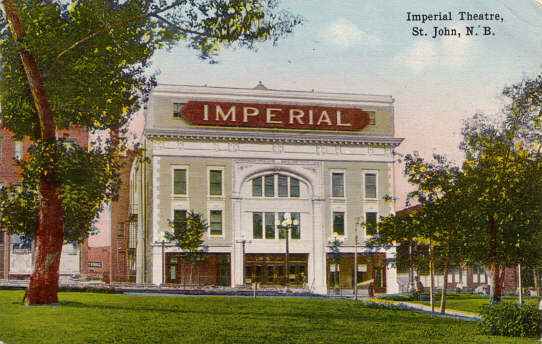 Front Text: "Imperial Theatre, St. John, N. B."